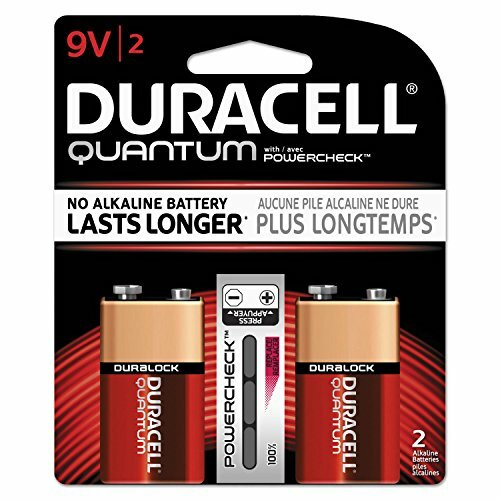 Duracell® Quantum-a revolutionary advancement in battery technology. It's the only battery with Hi-Density CoreTM Technology for unbeatable long-lasting power and PowercheckTM for instantly checking your power level at any time. Duralock Power PreserveTM Technology is guaranteed for 10 years in storage. Quantum batteries are ideal for use in many battery-powered devices, including portable electronics, wireless mice, testing equipment, remote controls, flashlights, calculators, clocks, radios, keyboards and more. Battery Type: Alkaline; Battery Size: 9V; For Use With: Everyday Electronic Devices; Voltage: 9 V.
PowercheckTM allows you to see remaining power at the press of a button.